When I arrived at the Dead Sea, the weather was going crazy. We had escaped Jordan's capital, Amman, just before a huge blizzard struck, and the snow had yet to catch up with us. The wind, however, was howling, and the rain was driving. It wasn't cold, which was pretty odd, but it was fairly miserable. The Moevenpick, however, was a stunner. Designed to emulate a traditional Arab village, the rooms are spread over a fair bit of land, reaching down to a private stretch of beach where you can float in the dead sea. One of the staff members kindly drove me down to the beach so I could have a look, in one of the golf buggies they use to transport guests around. It was a lovely gesture, but I had also just been handed a fresh lemon juice, and an information pack. So as I sped down to the sea, I was trying to balance sheets of paper, a room key, my passport and a full glass of sticky juice. Needless to say, I didn't do a very good job. The buggy was flying every which way, and the wind was coming at me from all sides. I finished the buggy ride hysterical with giggles, and covered in splatters. The sea looked beautiful, but alas, the beach was closed. If I had attempted to float, I would have been blasted over to Israel with the gale. I was a little disappointed, but I did still get my float, oh yes. 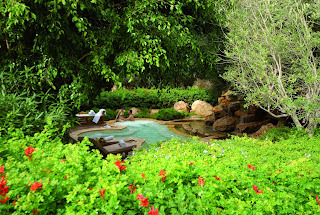 Down in the spa, they have a number of little pools, with varying levels of the dead sea water within. So I managed to float, while looking at the dead sea outside the window. Which is close enough for me. It was a surreal experience, I must say. And one that reduced me to the kind of giggles you really don't want when you're by yourself. No one else was giggling. But each time I moved, my legs swung out from underneath me and I was bouncing around the surface. I loved it. But back to the room. My suite was just beautiful, and it almost made up for the hurricane blowing outside. You can't really make it out in the picture above, but those palm trees were blowing sideways. The beautiful pool above was just steps from my room. If the sun had been shining, I would have been in absolute heaven. But let's get back to business. 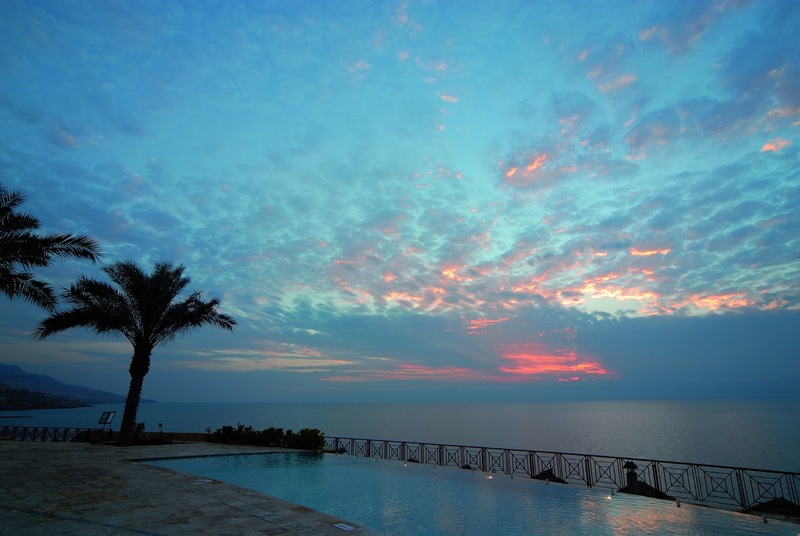 Right on the shores of the Dead Sea, this hotel is perfect for those looking for access to the beach. 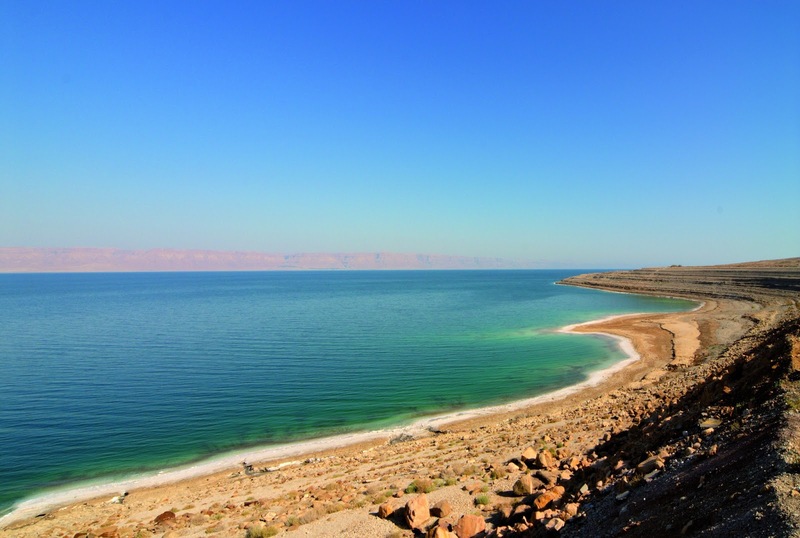 I was told it's quite difficult to get to the Dead Sea without staying in one of the hotels along the shore. This may or may not be true, but if you do want a day or two out there, this is definitely the place to do it. From what I could see (from the car) there's not much to see outside of the hotels. So if you're going to hole up, do it in style. I was in a deluxe room, with a gorgeous bed, loads of space and a patio that led straight to the pool. I stayed in two Moevenpick hotels during my time in Jordan, and I would be confident in saying that the rest of them are of a very high standard. When I ate in the Aqaba one, there was a Swiss looking man inspecting the floating candles. He looked as though he would pull out a ruler to inspect wick length. A really nice touch in the Moevenpick rooms? FREE MINIBAR! That's replenished each day. No booze, but you're not charged €5 for an orange juice. Gorgeous dead sea toiletries too. There were a few restaurants there, but I dined in the same one for my breakfast and dinner. Both were a buffet affair, with quite a variety of foods. Most importantly - there were a huge range of pastries. Dinner wise, I stuck with Joranian style BBQ. It was good, but the meal I ate in the Aqaba hotel was infinitely better. I'll get to that in a later review. These ducks hung out by the restaurant entrance. Each time I saw them, I said "Great weather for ducks, hey?!" And they laughed for hours. As you'd expect in a 5* resort, the staff were all lovely. There was free internet in the rooms, but without my laptop I was a bit stuck. Instead of pointing me to the business centre, the concierge told me to head to the bar, where they would lend me an iPad. So I bundled up with a glass of wine to check my emails. Lovely. Rooms start at €198 including breakfast.